A man who stayed behind to defend his home from a bushfire in western Australia used scuba-diving equipment to escape the blaze. While others in the town of Margaret River fled their homes, Peter Fabrici got his wife to safety and then went back to fire-proof his home. Seeing houses in the distance going up in flames, he donned wet clothing, an oxygen tank and goggles. When the flames got too close, he jumped into his neighbour's pool. Before the bushfire arrived, the 53-year-old stuffed rags into gutters and fixed sprinklers on the roof to prepare his house for the flames. "There were spot fires everywhere, the wind was increasing, the smoke was getting thicker and I basically stayed with the house as long as I could," he told Australian broadcaster Channel 9. But when the flames approached, he was forced to submerge himself in his neighbour's pool and use the scuba-diving gear. "It was 3.04 to 3.09, I remember looking at my watch. And just looking up and seeing the red and the black going over the top. "I stuck my head up at the end of the lap pool, I had a direct view of our house and I was just absolutely amazed. There were no flames coming from it." Mr Fabrici said his makeshift protective gear had made the difference. "Without the clear vision and without a clear source of oxygen, there's no way of staying in a situation like that. But as it turned out, it all worked beautifully and the house is still there and I'm still alive." 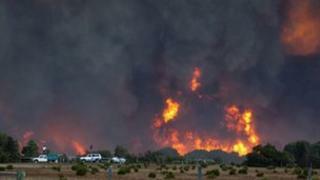 At least 37 homes were destroyed and some 3,177 hectares (7,850 acres) burned by the bushfire.